Engineering electrical systems for machinery and plants is super-easy with WSCAD SUITE, regardless if you are designing tooling machines, manufacturing plants, agricultural machines, rail vehicles, environmental technology or power plants. The complete electrical design is integrated across several engineering disciplines: piping & instrumentation, electrical schematics, fluid power, cabinet design, electrical installation and building automation. Having consistent data across these engineering domains simply prevents errors. To finish your projects faster, simply access over 1.3 Mio. parts from over 210 manufacturers in wscaduniverse.com. Structuring your projects according to norms (i.e. IEC 81346) keeps you safeguarded in case of liability. WSCAD SUITE is able to do that. Importing CAD- / PDF data from partners or suppliers helps you to finish your projects on time and on budget. Securely save employee knowledge in WSCAD project templates including the right parts data. Once an employee leaves, their know-how will still be available within the company. 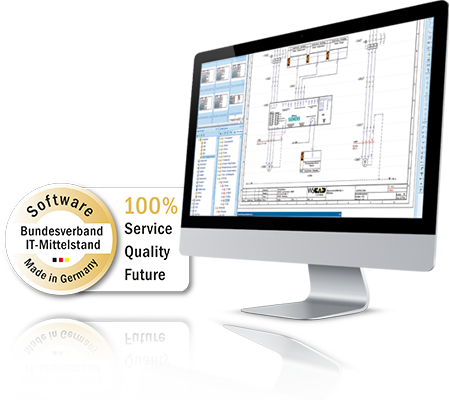 Easy-to-Use: amongst other prices WSCAD software has been awarded with the „Golden e“for its easy to use user interface. High productivity guaranteed! Access over 1.3 million parts data and symbols from more than 210 manufacturers in wscaduniverse.com and save yourself the hassle of designing the parts. Use one single software to handle different aspects of a machine or plant: circuit diagram, hydraulic/pneumatics, piping and instrumentation diagram, cabinet engineering, network plan, etc. Store your know-how in standard project templates. Reusing these templates saves enormous amounts of time and substantially improves the quality of your output. And your costs will be decreasing. Gather data once (!) and then access it seamlessly across all engineering disciplines: from the measuring point of a sensor to the terminal in the cabinet. Make use of the WSCAD integration to PLM and ERP systems to integrate all engineering data in one backbone. It significantly reduces errors and rework. The complexity of machines and plants is increasing – WSCAD software has been awarded for its ease of use. It is helping users manage all that. Even if you are not an expert, with WSCAD you can easily manage engineering data across various engineering disciplines: piping and instrumentation, electrical schematics, fluid power diagrams, cabinet design and manufacturing, electrical installation and building automation. Save yourself the hassle of designing electrical parts by yourself. Simply access over 1.3 million parts and symbols from more than 210 manufacturers in wscaduniverse.com and you are ready to go.